Mountain Construction proudly shares with us this beautiful mountain home that combines contemporary and rustic features with one of the best views in the High Country. For more information or a free building consultation please contact us. When Mark and Susan were ready to move to the North Carolina Mountains, they didn't want a simple log cabin. 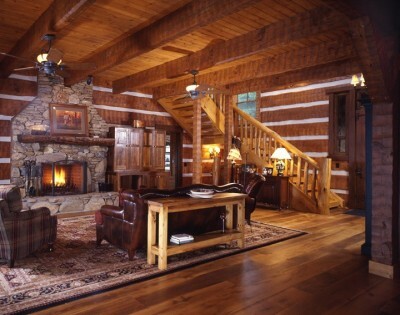 They envisioned a Log Lodge for gatherings with family and friends. They contacted Mark Kirkpatrick of Mountain Construction and Hearthstone Homes in Boone. 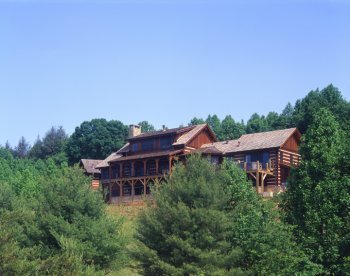 Mark has been building Log, Timber Frame and Conventional Frame homes, from contemporary to rustic styles, since the 1980's and remodeling homes and lodges in the Blue Ridge Mountains. Says Mark, "We felt [Mark had] the vision, experience and creativity that we wanted in a builder." The couple tagged Diane Davant Interiors to help with decisions for room detailing. Mark and Susan imagined a home that would look like a small log cabin built in 1780 and added onto as the family grew and prospered. 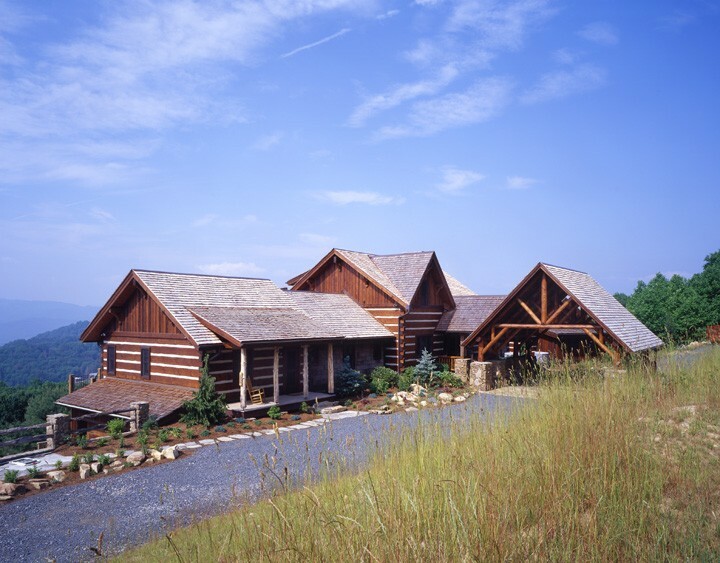 They wanted each "addition" as a different style, built of material that pioneers would have on hand: log, board and batten siding, bark siding, shake, stone and other natural elements. The focus would be Hand-hewn Appalachian Style Log and Hand-hewn Timber Frame. 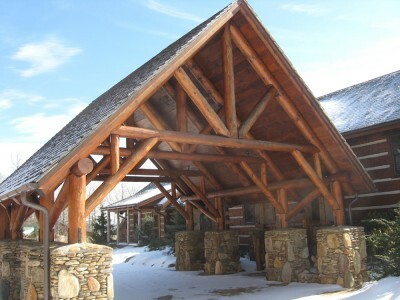 The couple worked with Mark and Hearthstone Homes to design the lodge, which is made of massive "Timberwright" 8" x 16" logs, Timber Frame and conventional framing with a massive round-log portico entry to protect guests from the elements. As you enter the home you are greeted by some of the warm custom touches featured throughout: antique wide plank hardwood flooring, antique barn wood entertainment center and a massive stone fireplace. Stairs leading to the upper level are made of 6" x 16" free-of-heart-center oak stringers and 4" x 14" FOHC treads with round oak pickets, rails and posts all hand-peeled, cut from standing dead trees. The timbers, from a massive oak tree that was struck by lightning, were cut on-site. This kind of sustainable effort is common practice for Mountain Construction and its NAHB Certified Green Professionals staff. The Great Room is the main Log section of the home. The 8" x 16" logs, heavy girders and beams all have the "live-edge" from the trees, hand-hewn square. The fireplace below is made of antique brick with a woodstove for sustainable heating that rises upstairs, the way the pioneers would build it. The home, built across the hillside, is designed to take full advantage of incredible long-range views. 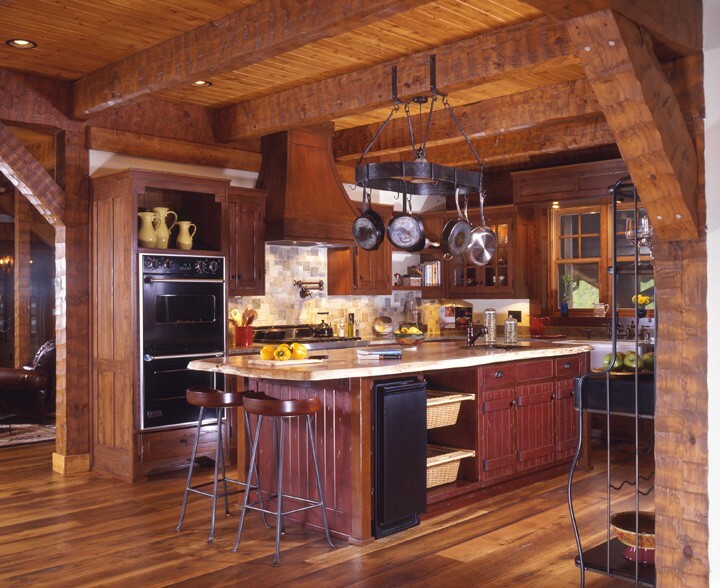 The open kitchen is a warm, family-friendly space with reclaimed oak cabinets, granite countertops and the contrast of differing counter levels and offsets in the cabinet design, as if it was built in sections as the resources for the pioneer family grew. The painted 4' x 12' bead-board poplar island is topped with a hand-crafted spalted maple "live-edge" slab designed for small, impromptu lunches. The Dining Area features comfortable seating for the entire family and guests. 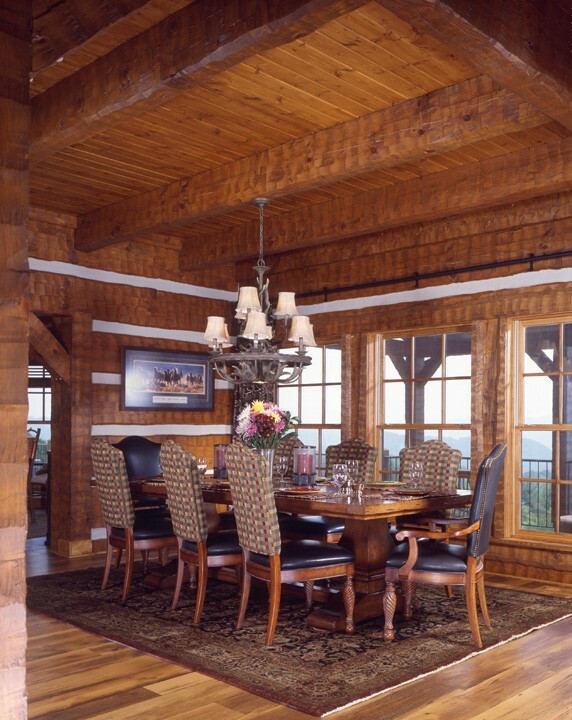 An adjoining bay holds the Breakfast Nook, where the couple shares most of their meals. This room also enjoys stunning long-range views. Just off the Great Room is a hand-hewn Timber Frame Sun-porch for enjoying family time on cool summer days, with decks extending across the back side of the home on two floors. The views from these decks are breathtaking and make for the perfect summer afternoon. There are two master suites on either end of the main floor, built using Hearthstone logs with vaulted ceilings. The main suite features a Sitting Room with windows on three exterior walls, once again, to take advantage of the views. The home has additional living space on the Lower Level with a Kitchenette for guests. There is another Bedroom and Bathroom on the Second Floor as well as Mark's office, and a front and back stair and elevator to the Lower Level. 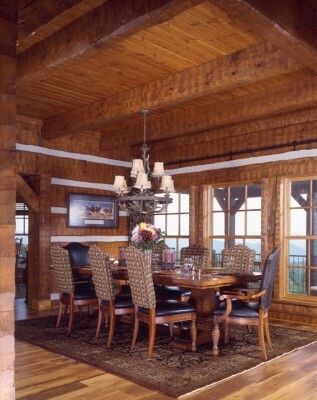 The many custom features are what make this home unique among mountain lodges. Each room has a different interior finish; window and door trim varies throughout. The Master Suite, for example, has trim that was made from 1" Live-Edge log veneer cut to a 4" trim with natural edge of the tree intact, while the Sunroom features more refined furniture-grade trim. The doors are custom-made with differing heights, fitting the vision of the homeowners as site-built as the home grew in size. All doors are different wood species and are designed to fit with the style of each room. Perhaps the most stunning feature of this home is the round-log portico. The impressive structure was built on-site by Mountain Construction. The logs are all hand-peeled pine and are engineered to include concealed steel fasteners. The foundation for the portico and the access to the front door are massive weathered rock. The detached garage was designed to look like a Tobacco Barn from the olden days, with Board and Batten siding and a worn-look finish. The couple is thrilled with their new home and enjoys spending time at the Pioneer Mountain Lodge with friends as well as their children and grandchildren.